UCLA research could lead to a simple saliva test capable of diagnosing—at an early stage—diabetes and cancer, and perhaps neurological disorders and autoimmune diseases. 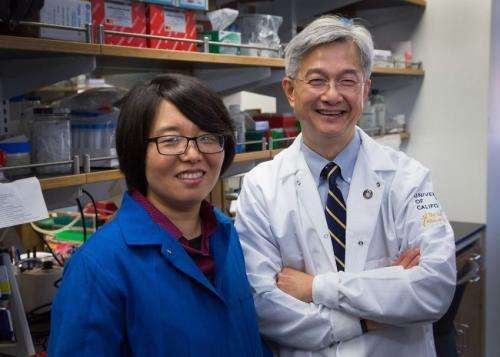 "If we can define the boundaries of molecular targets in saliva, then we can ask what the constituents in saliva are that can mark someone who has pre-diabetes or the early stages of oral cancer or pancreatic cancer—and we can utilize this knowledge for personalized medicine," said Dr. David Wong, a senior author of the research and UCLA's Felix and Mildred Yip Endowed Professor in Dentistry. Wong's research over the past decade has focused on identifying biomarkers in saliva. His laboratory discovered that some of the same RNA that is inside human cells are also present in saliva and can be used to detect diseases—a surprising finding, he said, because enzymes in saliva can degrade RNA, making the mouth "a hostile environment." Among the many forms of RNA are some unusual ones that live in the mouth and in cells. For example, it wasn't known until very recently that RNA comes in a circular form; the linear form has long been known. But the UCLA scientists identified more than 400 circular RNAs in human saliva—the first discovery of circular RNA in saliva or any body fluid—including 327 forms that were previously unknown. The scientists compared microRNA levels in saliva to those in the blood and other body fluids, and found the levels of microRNA in blood and in saliva are very similar—indicating that a saliva sample would be a good measure of microRNAs in the body. Their overriding conclusion is that saliva has tremendous medical and scientific value. In the not-too-distant future, dentists might be able to take saliva samples to analyze for a variety of diseases. And, Wong says, the research could lead to a new category of self-diagnostic devices. "This could indicate that wearable gear that informs you whether you have a disease—even before you have any symptoms—is almost here," he said.